…until my mind started wandering. 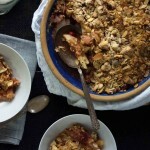 It wandered off into dangerous territory with thoughts of crumble and streusel. Thoughts of a cake you might get away with serving as breakfast. Rings, tubes, bundts. Buttermilk, sour cream, oh my…I had to bake another cake! This time around, I went for a cinnamon-spiced sour cream apple cake, loaded with fruit, and topped with an addictive brown sugar crumble. It’s perfect, warm from the oven with a cup of coffee or your afternoon tea. Go for decadence and top it with a scoop of cinnamon ice cream and you’re looking at a very worthy fall dessert. 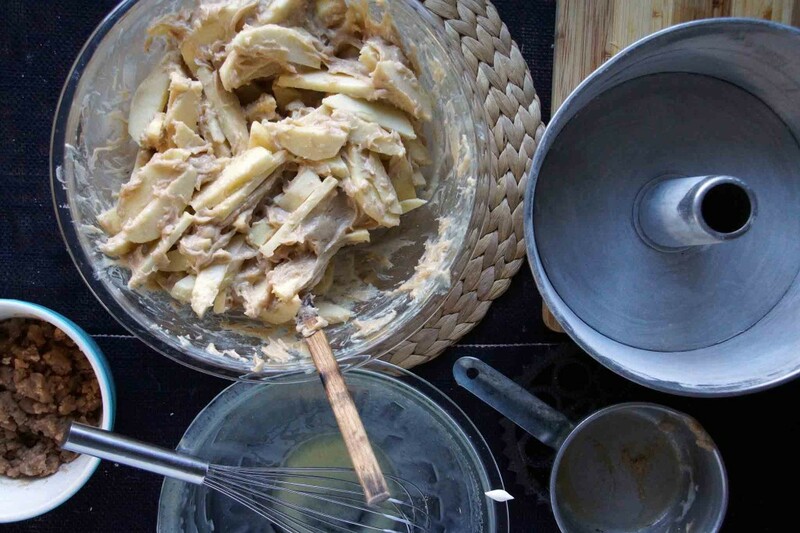 I think it’s safe to say there will never be just 1 apple cake in my life; this is a field I’ve got to keep playing. 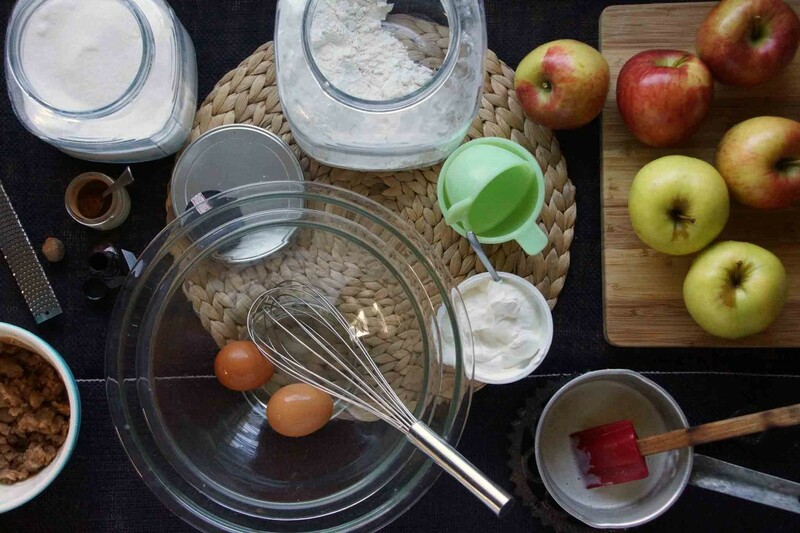 Round up your baking basics plus a container of sour cream and a bunch of apples. I wanted a cake packed with apples. 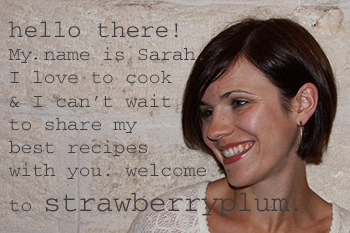 I used 6 big apples–2 Golden Delicious and 4 Braeburn. 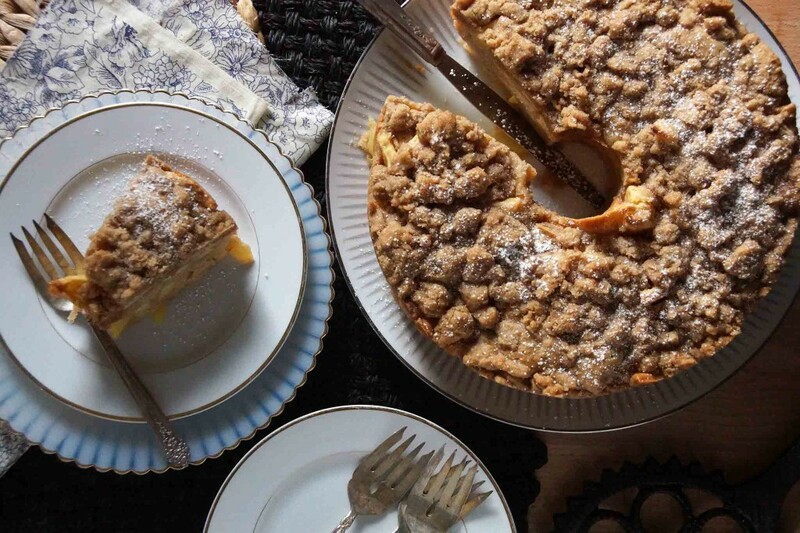 Start with what is bound to be everyone’s favorite thing about the cake: the crumb topping (duh.). Mix brown sugar with flour, cinnamon, and melted butter until large crumbles form. 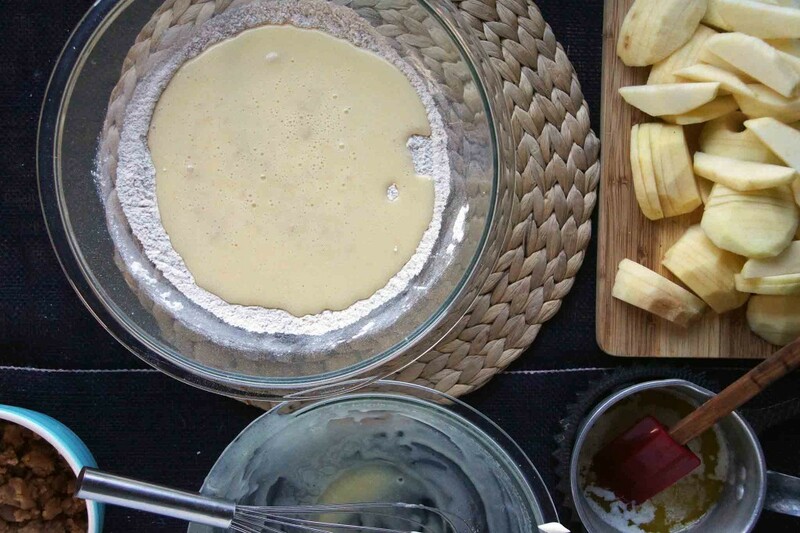 Peel and slice the apples, then mix up the cake batter. Combine flour, baking powder, cinnamon, and nutmeg in 1 bowl; eggs, sugar, vanilla, sour cream, and butter in another. Stir the wet ingredients into the dry, then fold in the apples. 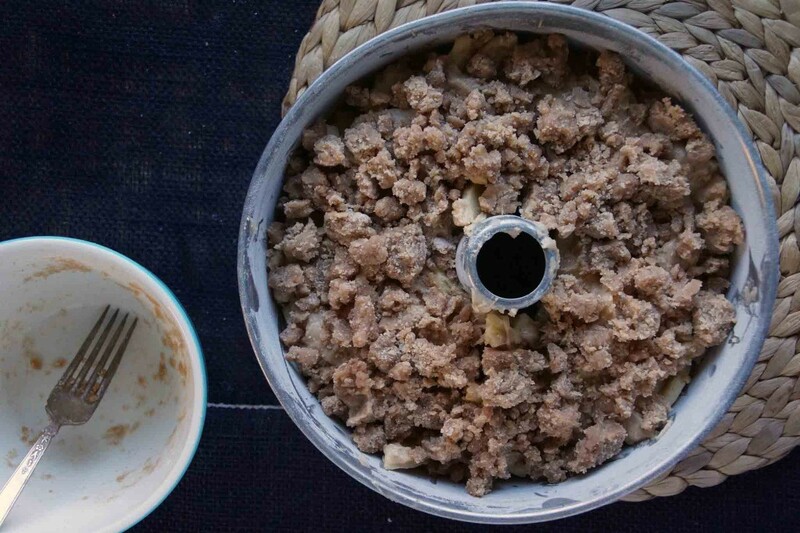 Dollop the apple-laden cake batter into a greased tube pan and top with the brown sugar crumbles. No snitching! I mean, not too much snitching! Bake. Cool as long as you can bear, then pour the coffee and cut everyone a big hunk. 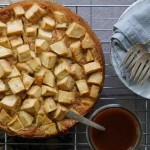 I’m loving this apple cake “research” so much I might purposely never find The One. This cake is great for dessert and, as I happen to know, perfect leftover with morning coffee. First, make the crumb topping. Whisk together flour, brown sugar, cinnamon, and salt in a small bowl. Pour in the melted butter and stir with a fork until large clumps form. Set aside. In a large bowl, whisk together flour, baking powder, salt, cinnamon, and nutmeg. 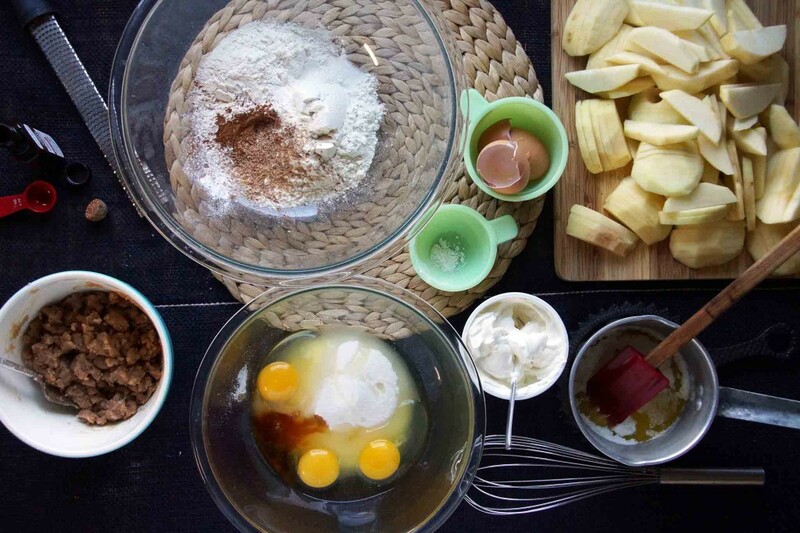 In a medium bowl, whisk together the eggs, sugar, vanilla, sour cream, and butter. 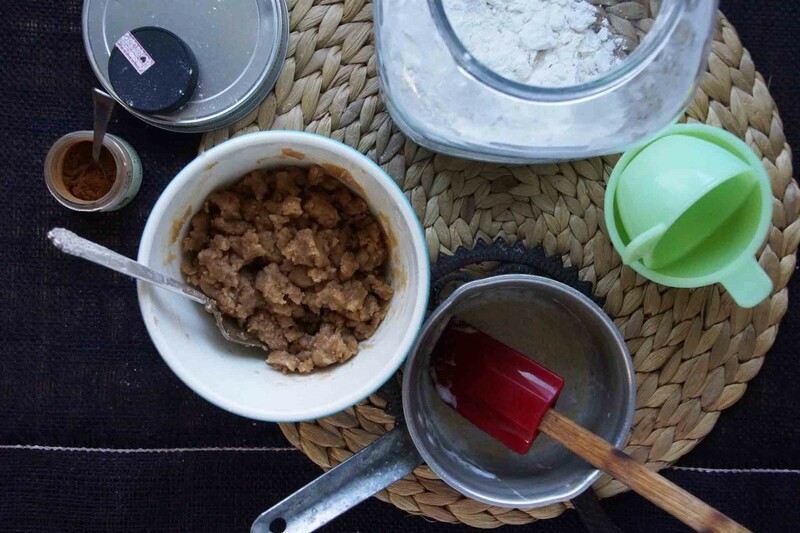 Pour the wet ingredients into the flour mixture and stir until just combined. Fold in the apple slices. Dollop the cake batter into the prepared pan. Spread with a spatula to evenly distribute the apples and create a fairly level top. Sprinkle clumps of the crumb topping evenly over the top of the cake. Bake until a tester inserted in the center of the ring glides through the apples and comes out free of cake batter, about 1 hour, 5-10 minutes. I would start checking at 50 or 55 minutes as apple cake baking times tend to vary based on size/variety of apples used. Cool the cake for 10-15 minutes in the full pan, then remove the outer portion and allow to cool at least another 15 before you attempt to pull it off the pan completely. Serve the cake warm, sprinkled with powdered sugar, with a scoop of ice cream, or a dollop of whipped cream. Gotta try this one for sure! 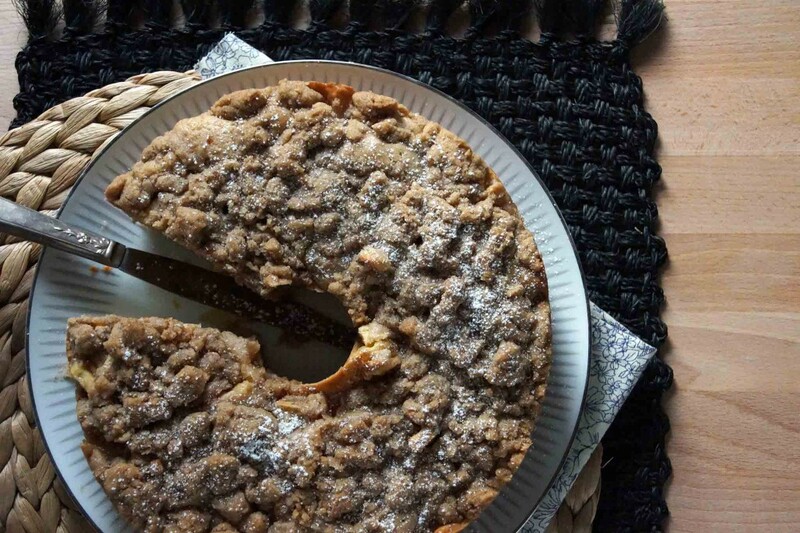 Oh that is one glorious ring of brown sugar crumble…! I made it and it’s delicious – everyone who tasted it, loved it! Thanks, Aunt Margaret-I’m very glad to hear that! This looks amazing! Could I make this the night before Thanksgiving and store it in the fridge? Or should i leave it out?? Absolutely. I kept it on the counter for 3 or 4 days and it held up well. Thanks for the recipe but it’s not one of the best apple sour cream cakes I have made. It looks yummy but my one didn’t work out. I found it was a very heavy cake. I served it with ice cream as the recipe stated and it was a bit too rich and doughy. Thanks anyway. Sorry, it didn’t work out for you. I made it, and found it to be yummy but very heavy ,too. I am wondering what can be done to lighten the actual cake? It is almost a dense pudding. Do you think adding more baking powder would help? Maybe adding some baking soda? Can I use a bundt pan for this? Any modifications I should make? Hmm…the crumb topping would end up on the bottom, which may be taste good, almost like a crust, but it also might end up getting soggy. I think the baking time would be pretty similar. 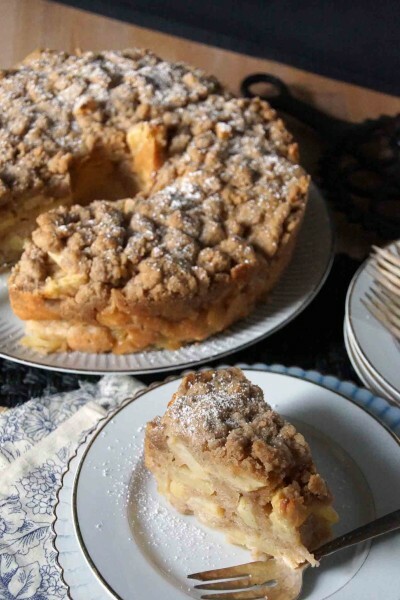 Could this sour cream apple crumb cake be made in a bundt pan as well? I wouldn’t use a bundt pan unless you’re making it without the crumble (and why would anyone want to do that?! ), as the crumb would end up on the bottom and likely become quite soggy. This cake brought back wonderful memories of a bakery in Hawaii that made something very similar that my then pre-teen daughter loved. She’s 43 now and wants the recipe, too. Thanks! Thanks, Elaine–what a nice thing to hear! I’m so glad my cake brought back fond food memories. Just made this for my daughter’s 23rd birthday cake. It was yummy! The house still smells so good. Lovely! I’m glad you liked it! How do I print out the recipe without all the extra stuff–like people’s comments? Under the photo in the recipe box, there’s a “print” button. Click this and you’ll be able to easily print just the recipe! I cannot figure out the kind of pan to use that the sides come off. When I look at the picture it does not look like it comes apart. Please help. It’s a tube pan. It’s 2 pieces and the bottom lifts out. Here’s a link to a picture–hope that helps! I got mine for a dollar or 2 at a thrift store. I made this tonight. It was good, moist. I was unable to get the topping to form large crumbles. It stayed the consistency of thick batter. I ended up having to try create “crumbles”. I think I will try not melting the butter next time. 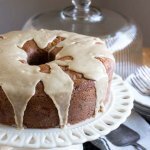 I have been making my sour cream coffee cake for years. Thanks for a new idea. If i made this is a normal spring form pan, would the cooking time be longer? I imagine it would take longer since there won’t be air flowing through the middle like there is with a tube pan. I’d just keep an eye on it and let us know how it turns out! Just wondering about the pan. Is this a tube pan but like a springform pan? I made the apple cake for dessert with dinner tonight. My grandkids loved it. The thing that always disappoints me about apple cake is you can’t taste the apple. This is more like a crumble topped aople cake/pie. This recipe is a keeper. Also, I used a tube pan without a removable bottom, and the cake came out with no trouble.